How to Get Rid of Possums - Remove These Pests in your Home & Yard! If you find an opossum in your attic, it’s only natural to wonder how to get rid of them! The only marsupials of North America, opossums actually help us by eliminating unwanted pests. Read on for easy steps in how to get rid of opossums and make them go back to their natural environment. Do you know how to make an opossum uninvited? Are you interested in knowing what household cleaner opossums find annoying? Do you know the correct size trap to use for capturing these pests? Keep reading if you want to learn how to remove them from your home and yard forever. We have constructed easy to follow steps on getting rid of possums. An opossum, also nicknamed a possum, might be an ugly sight with a head shaped like a triangle, a white face, and a naked pink tail, but the Cary Institute of Ecosystem Studies argues that this homely marsupial that carries babies in a pouch is an amazing tick killer. Through a scientific study, a comparison was made between catbirds, veeries (a forest bird), squirrels, chipmunks, white-footed mice, and opossums on how well each animal eliminated ticks and the finest tick eradicator of the entire group were ugly animals. Scientists in this study counted dead ticks in opossum droppings and estimated that in just one summer season, a single opossum waddles through its environment, collects, and then eats about 5,000 black-legged ticks, which are the carrier of Lyme disease. A problem for opossums is their poor public relations appearance, because instead of looking cute and cuddly like a deer fawn, they drool and hiss if threatened, making you think that they carry rabies, when in reality, opossums are resistant to rabies. 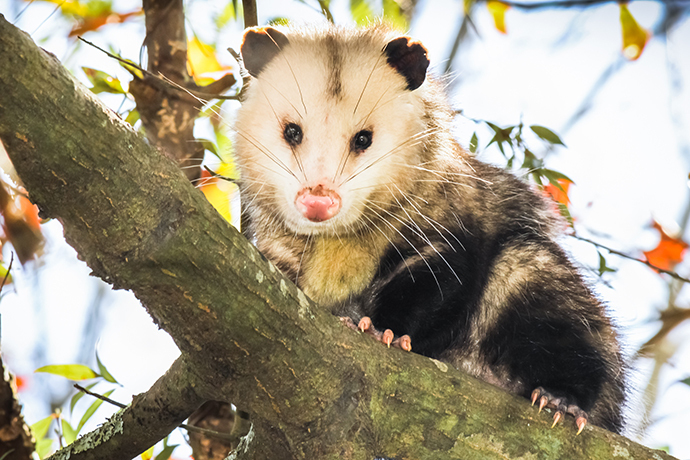 Despite their benefits, opossums are wild animals that you really don’t want hanging around your home or yard, and the Texas A&M AgriLife Extension Service recommends if you see an opossum outside in your yard, simply leave it alone and it will move away in its own time. Another suggestion is to make your yard inhospitable to these pests by first, cleaning up food, such as pet food dishes; second, collecting fruit on the ground or unpicked fruit in trees; and third, collecting up any trash on the ground, or unprocessed compost. This is the best way to get rid of them in the first place. Opossums are always looking for ways to hide from predators, so you need to eliminate hiding places in your yard, such as access into sheds or outbuildings, or the ability to hide in a firewood pile, a brush pile, under the porch, or in tall vegetation. So, if you remove these places that they love hiding out in then you could easily get rid of them in time. You have to think like an animal and look for food that it might eat or places it might hide in your yard and get rid of all of these opossum-loving items, so that any visiting opossum leaves your yard behind and moves elsewhere. 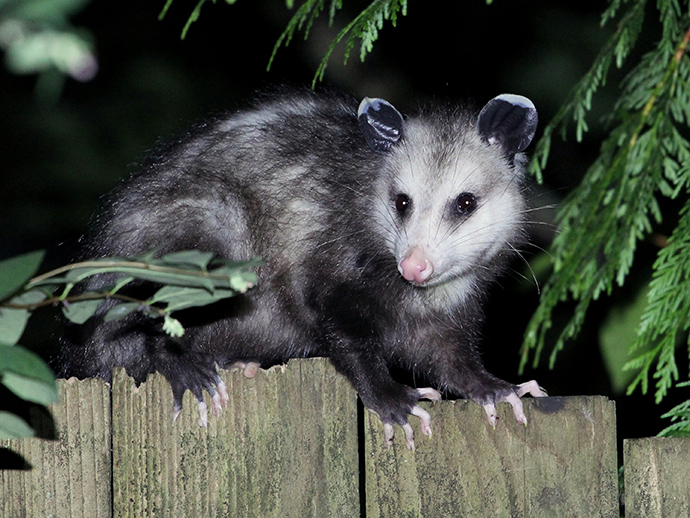 What If an Opossum Is in Your House or Yard? Opossums are nocturnal creatures, giving them a natural attraction to the dark attic of your home. They dislike lights and find the smell of ammonia obnoxious, so a simple solution for getting rid of an opossum in your attic is to leave lights on and deposit an ammonia scent. Once you've tracked down the animal then it's a much easier job from there on. Wildlife Rescue of Austin, Texas suggests soaking rags in ammonia and leaving them in different areas of the attic for three nights in a row, while also leaving a light on, and the combination will disturb a visiting opossum, forcing it to leave your attic. To ensure that the opossum is gone, sprinkle a dusting of flour on the floor of your attic, follow up with regular checkups to see if animal tracks show up within the floured surface, and if none appear, seal the hole that allowed the animal entry into your attic. You can also use a live trap to capture an opossum and remove it from your house, but make sure to buy a big trap, such as one rated for a raccoon, like a 10-inch (25-centimeter) by 12-inch (30 centimeter) by 32-inch (80-centimeter) Havahart Easy Set® 1092 trap. Bait your trap with marshmallows and place the trap right on the floor of your attic, or on the ground if you’re trapping outside, and near walls, if possible. Check your trap regularly and remove anything caught in your trap, releasing it to the outdoor environment. For details from Havahart® on how to release an opossum after capturing it in a live trap, watch this YouTube video. Try leaving it alone and let it go on its own. Make your yard inhospitable by collecting pet food, picking fruit, cleaning trash, and mowing down tall vegetation. Leave rags soaked in ammonia and keep a light on, if an opossum is in your attic. 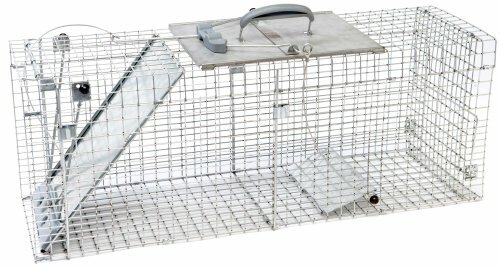 Use a Havahart Easy Set® 1092 trap to capture the opossum and release it outdoors. Try not to harm the opossum, since these critters are beneficial by eating up to 5,000 ticks each season. Please write a comment if you have a question. ​Go back to our homepage if you want to learn more about easy pest removals in your home and yard.